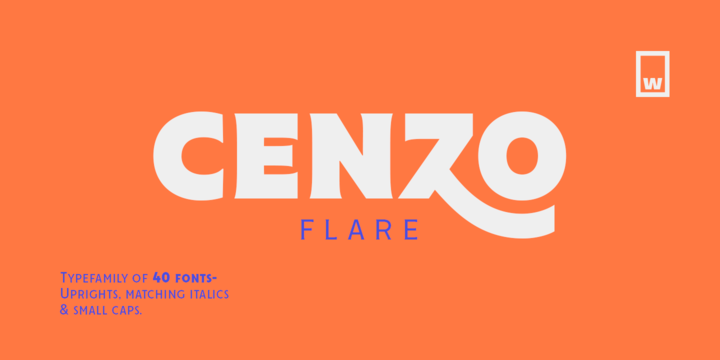 Cenzo Flare is a contemporary typeface created by Bana Arasanz and published by W Foundry which it has a sans serif base with a touch of flare. It is available in 40 styles, 4 wdths (Normal, Condensed, Inline, Line) each with 5 weights (Light, Regular, Medium, Bold, Black) and italics, a wide range of OpenType features and language support. It was designed to be suitable for advertising, poster, haeadline, editorial use, poster etc. It is iadeal for any kind of project. Cannot miss it! Price: starting from $19,90 for one font to $210,00 for all 40 fonts. A font description published on Wednesday, October 25th, 2017 in Bana Arasanz, Fonts, W Foundry by Alexandra that has 1,975 views.